Like most of us, Jillian has loved and cared for animals her entire life. She began adopting her own pets during college when she rescued her beloved Tabby cat, Miguel. 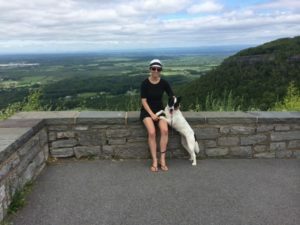 Jillian moved from New York to Boise with Miguel and her best girl and running partner, Lucy, a rescue Border Collie/Australian Cattle mix. When they’re not running together, Jillian brings Lucy to work with her at the firm where she works as an attorney; Jillian also currently works part-time for The Pet Sitter of Boise. Jillian has bonded with many of the pets in her care. She is compassionate and the pets warm up to her quickly. In addition to animals, Jillian loves any kind of outdoor activity, especially running, hiking, biking and skiing! Jillian is more than happy to take any dog who’s up for it for a fun run around Boise! When she’s not working or pet sitting, Jillian enjoys reading, camping and spending time with her family.